One of my favorite projects of the year is researching a holiday card company for our family holiday card. This year we have chosen Minted. Individuality: The designs look like nothing I have seen on the other online card sites. Minted has stand-out-from-the-crowd holiday cards available in one-of-a-kind shapes, great patterns, cool fonts and neat-o designs for the back of the cards. 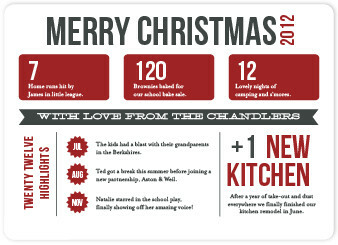 You can even create a fun infographic of your family’s highlights of the year! Affordability: Times are tough, and I know that we have been tempted several years to skip the Christmas cards in order to save money for our family. However, this is a tradition that is so important to our values, connections with loved ones and sense of community. And the quality-lover in me does not want to send a shoddy card to our peeps! 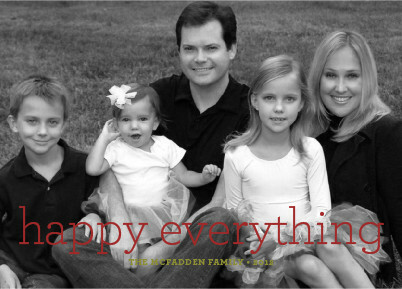 I love how Minted provides a happy medium with its Holiday Postcards. You can create a beautiful, top quality paper postcard — with photos of your family on two sides — to send out for just 69 cents a card. That’s a big win for our family budget. Faith: I love that Minted has Christmas and Hanukkah specific designs, as well as inclusive holiday designs such as the “happy everthing” sentiment above. Heck, if you have welcomed a new child into your family you can even combine the holiday cards with your baby announcement thanks to Minted’s Baby’s First Christmas/Holiday cards. Photo Quality, Graphic Design Staff & Options: Minted’s software provides great photo quality controls and it allows you to crop or change your photo to black/white, sepia and other dramatic filters. (The photo editors are better than the picture editing software that came with my laptop.) I love how with the Minted software you can take a regular backyard picture with your point-and-shoot and end up with a gorgeous framer of a card. Your proof will also be reviewed by a professional, real-person graphic designer to make sure your card looks its best at no extra charge. Coupon Code: After we made our decision to go with Minted this year, I opened up my favorite monthly treat, Real Simple magazine, and saw a featured Minted coupon code! Use the purchase code RSHOLIDAY at checkout and get 15% off your order! 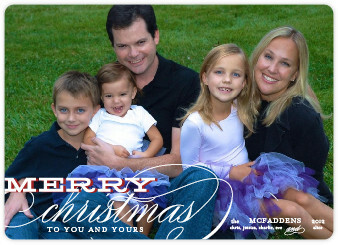 I highly recommend Minted for holiday cards. I believe the quality and design choices are a good use of our hard-earned family funds. Disclosure: I received products for review to facilitate this review. All opinions expressed are my own. Photography by Denise George. All rights reserved. This post is so timely. I was just looking at minted. I’ve never used them before but they have a card I love sitting in my cart and I can’t pull the plug. Thanks!